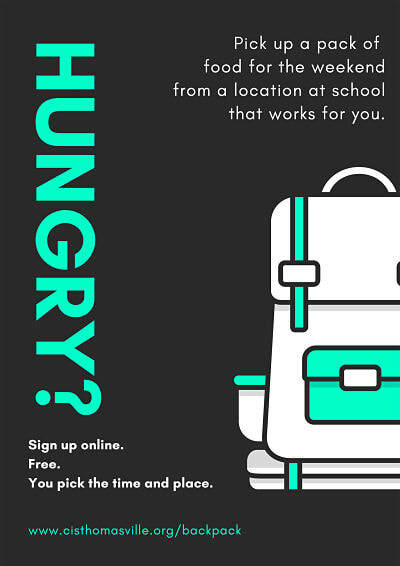 We know that hunger can impact a child's ability to concentrate and do well in school. We want to make sure that all children have enough food. Communities In Schools (CIS) of Thomasville provides weekend food backpacks for children who might go hungry on weekends when school meals are not available. Each food bag contains 2 breakfasts, 2 lunches, 2 snacks, 1 can of vegetables, and 1 can of fruit. All food is nonperishable and provided to families free of charge. If you would like more information on this program, please click on the button below to fill out a short form. A CIS representative will contact you with more details in the near future. Click the button below to fill out a form for more information.